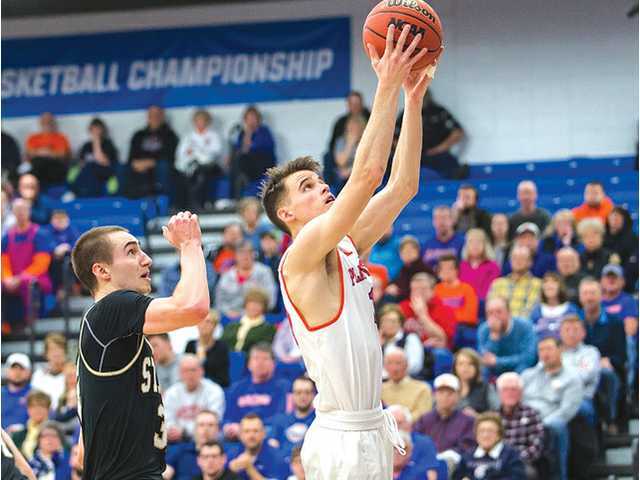 Senior guard Matt Oestriech swoops in for a layup in UW–Platteville’s 74–68 NCAA Division III second-round victory over St. Olaf Saturday night. Oestrich finished with 13 points and nine rebounds. POSTED March 7, 2018 12:23 p.m.
PLATTEVILLE — UW–Platteville beat St. Olaf College (Minn.) 74–68 Saturday night on the Pioneers’ Bo Ryan Court to advance to the Sweet 16 in the NCAA Division III basketball championships. UW–Platteville (24–4) is making its eighth Sweet 16 appearance and first since the 1999 national championship season. The eighth-ranked Pioneers host Nebraska Wesleyan (26–3), an 82–61 winner over Aurora, Friday night at 7:30 p.m. WIAC tournament champion UW–Stevens Point (21–8, ranked 17th), and top-ranked Whitman (Wash.) (28–1) will square off in the other third round game Friday night at 5:30 p.m. The Friday winners will play Saturday at 7 p.m. for the right to advance to the NCAA III Final Four March 16–17 in Salem, Va.
WIAC Player of the Year junior Robert Duax scored 19 points, sophomore Carter Voelker had 17, senior Matt Oestreich 13, and junior Clay Gerds 10 for the Pioneers, who improved to 24-4. Austin Korba scored a game-high 20, while Frank Delany recorded 16, Robert Tobroxen 14 and Nate Albers 10 for St. Olaf, which finished 20–8. UW–Platteville led 33–28 at the half, but each time it looked like the Pioneers would deliver the knockout blow in the final half, the Oles answered. The Pioneers’ largest lead was 45–36 on a Voelker layup five minutes into the second period, but an Albers’ three-pointer brought the visitors within 45–41. The hosts then went up 50–41, but St. Olaf caught up and took the lead at 56–55 on two Tobroxen free throws with 5:43 remaining. A Duax basket gave the Pioneers the lead for good at 60–58 at 3:50. Leading 61–60, the Pioneers scored six straight points, capped by two Voelker free throws with 40 seconds left. Korba nailed a three-point basket with 34 seconds left, narrowing the deficit to 67–63. After Gerds made 1 of 2 free throws, St. Olaf’s Ben Scheffley knocked down two free throws, making the score 68–65 with 18 seconds left. Quentin Shields made a pair of free throws for the Pioneers for a 70–65 lead. St. Olaf, however, wasn’t done as Korba drilled another three-point basket. Shields and Gerds sealed the win with two free throws apiece in the final 10 seconds. The Pioneers tied the 1987–88 squad for the most home victories in a season with 16, and their 16–1 mark is just one loss off the undefeated home records set by the 1991–92, 1993–94, 1994–95, 1997–98 and 1998–99 squads. With the victory, the Pioneers raised their all-time Williams Fieldhouse record to 502–183 since the facility opened in 1962–63. Both UW–Stevens Point and UW–Oshkosh (20–7) advanced Saturday, giving the WIAC three of the final 16 teams. WIAC teams have captured 12 of the previous 43 national NCAA III championships, with UW–Platteville, UW–Stevens Point and UW–Whitewater having won four apiece. Only North Park, with five, has more. UW–Platteville improved to 33–6 all-time in playoff games, the best in NCAA III history. Friday’s meeting with Nebraska Wesleyan is just the second time ever, with the first coming in 1968. St. Olaf (20–8) — Dominic Bledsoe 2, Austin Korba 20, Robert Tobroxen 14, Frank Delaney 16, Ben Scheffley 6, Nate Albers 10. Totals — 23-52 12-14 68. UW–Platteville (24–4) — Jake Showalter 3, Matt Oestreich 13, Robert Duax 19, Carter Voelker 17, Clay Gerds 10, Alex Ranney 2, Quentin Shields 6, Trey Sigel 2, Justin Stovall 2. Totals — 24-58 20-24 74. 3-point goals — SO: 10 (Korba 4, Tobroxen 1, Delaney 1, Scheffley 1, Albers 2), P: 6 (Oestreich 1, Duax 2, Voelker 2, Gerds 1). Team fouls — SO: 20; P: 16. Fouled out — SO: Scheffley. The Pioneers pulled away from Monmouth, Illinois 91–76 in the first round game Friday on Bo Ryan Court in Williams Fieldhouse. The WIAC regular season champions burst out to a 12–2 lead against the Midwest Conference champions with seven points by Duax and five by Gerds. The Scots closed within 20–18 and hung tight for the rest of the first half, which ended with the hosts ahead 39–36. Monmouth took the lead at 43–42 on a Justin Aluyah three-point play and stretched it to 48–42 on an Aluyah three-point shot. The Pioneers tied the game at 53 on a Oestreich three-pointer with 12:38 remaining and re-took the lead at 55–53 on two Shields’ free throws. Leading 69–65, the Pioneers scored 10 straight points. Oestreich made a three-point basket, a layup and a jump shot, and Voelker finished the run with the field goal for a 78–65 lead with 3:26 left. Five Pioneers scored in double figures, led by WIAC MVP Duax with 20, Oestreich 19, Gerds 16, Shields 15 and senior Jake Showalter with 11. MWC Player of the Year Will Jones scored 24, Aluya had 19, and Stephon Bobbitt and D.J. Swift each had 10 for the Scots, who had their nine-game winning streak snapped. Monmouth (20–8) — Justin Aluya 19, D.J. Swift 10, Will Jones 24, Justin Batterton 4, Paul Engo III 7, Stephon Bobbitt 10, Lamar Watson 2. Totals — 24-65 21-25 76. UW–Platteville (23–4) — Jake Showalter 11, Matt Oestreich 19, Robert Duax 20, Carter Voelker 4, Clay Gerds 16, Quentin Shields 15, Trey Sigel 2, Justin Stovall 4. Totals — 29-56 28-38 91. 3-point goals — M: 7 (Aluya 2, Seift 2, Jones 2, Engo III 1), P: 5 (Oestreich 3, Duax 1, Gerds 1). Team fouls — M: 26; P: 20. Fouled out — M: Aluya, Bobbitt.